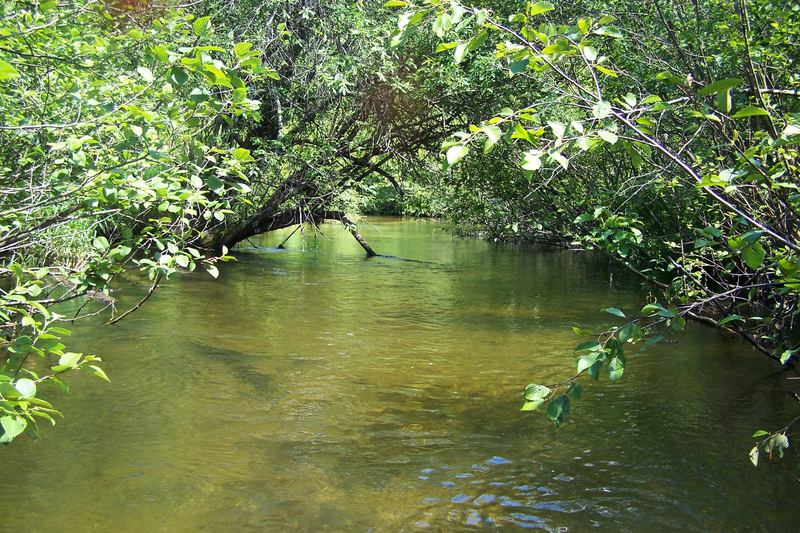 The Middle Branch and the Little South meet up at “The Forks” to create the main branch of the Pere Marquette River. I remember going up The Middle Branch so many years ago at dawn with Jake Lucas, my grandpa, and right off the bat he caught a 19 inch brown trout. Minutes later caught another the same size. We hadn’t gone 50 yards! I was about ten years old, tagging along to see how it’s done. He was using something I hadn’t seen him use before, a lead-head jig with white horse hair. He called it a doll fly. About all you can do with something like that is toss it like a spinner and let it drop to the bottom, bounce it along, and hope for a strike. I’ve tried jig fishing for stream trout a few times over the years but never had any luck with it. In the hands of a master is all I can figure. I had an errand to run in White Cloud last weekend so I packed my waders figuring it’s only another half hour north to the Middle Branch. Might as well try for a dinner trout or two. I checked the Little South and the Middle Branch. The water was clear, it was mid-afternoon, the exact wrong time to hit a trout stream. Still, worth a try. The Middle Branch is a very interesting stream. It’s loaded with trout but difficult to wade and cast. Half the time you are in waist high water, sometimes on tip toes. That adds another dimension to the underhand flip cast I use for 90% of my casting. To cast in chest deep water I use what might be called a revolver cast where, with arm up high, I swing the rod tip in a circle to launch the lure. Hard to explain, tricky to do. The other problem is the stream is so overgrown that getting out to get around a deep hole is treacherous, and dangerous. My older brother ran into some poison ivy on this stream few years back. About a 100 yards up from the forks I came to the first bend, veering to the left. At the bottom end there’s a sunken log all the way across the stream and I moved up to about ten feet of it and laid a cast up past the log into some cover on the outside bank. A sudden hit and I knew it was a decent fish. Unfortunately the trout headed downstream and went under the sunken log so my line was wrapped around it. I stopped him and watched him zig zag next to me. In this situation you can try to net the fish and cut your line, or move up to the log and try to horse him forward in front of the log, which I did. The other possibility is feed your rod and reel over the top and under the log and that’s fair play too. But I netted it reaching over the log. Nice fish. I decided right then to keep it for Sunday dinner and it’s a good thing because I didn’t catch another one. Saw a few but with the sun out and clear water it was tough fishing. She measured 18 inches. I fried the fillets up with cajun fish mix, made rice pilaf with fresh mushrooms as a side, and my wife threw together a fruit salad. We washed it down with an icy Corona with lime. I should have taken a picture of the whole meal. Now that was a photo! Hi Luther! Thanks for putting all this great advice on the web for others to use. I’ve been given a special opportunity to use a friend’s cabin this weekend on the Middle Branch, just off James Rd south of Baldwin. 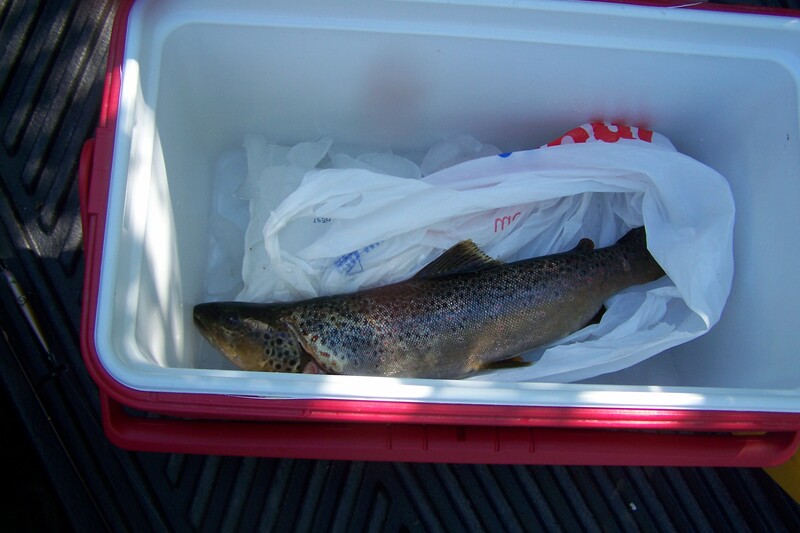 I am a novice fisherman, but I’d love to take advantage of this opportunity to catch some trout. At my disposal I have waders, boots, and a basic spinning rod (no fly rod/reel). I’m planning a trip to the local shop before I head up to stock up on gear. Could you share any casting techniques/lures and tips you may have for succeeding this weekend? Thanks! Hi Greg, Sorry it took so long to reply, didn’t notice I had comments. 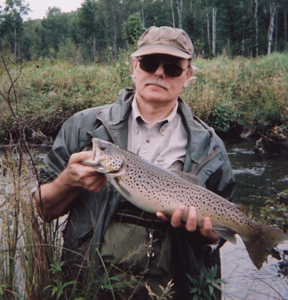 I hope you caught some trout – the middle branch has some interesting holes and cover, but is tricky to fish. There’s a “Categories” list in the upper right corner of the website. Click on “trout advice” to get posts that may be helpful. Thanks for checking out Fichigan. I’ll try to do more posts on techniques of spin fishing.